I know a guy who calcuates deck prices in Tarmogoyfs. Affinity? That will be 2-3 Goyfs. RG Tron? 3 Goyfs flat. Burn? Whoa there, down to 1-2 Goyfs! When the moderately played version of a card is running for $165 with shipping included, you know you are either playing Legacy or you are talking about Tarmogoyf. This article is designed to give some perspective on the Goyf “issue” in Modern. There’s a bigger question here about whether or not Goyf really is an issue pricewise, but I’ll save that for another time. For now, we are just seeing how we can approach Goyf for budget-minded players. For those players who already have your Goyf playset, this article can give you some ideas about how to attack decks that rely too much on Magic’s most efficient beater. Before we start trying to figure out ways not to use the $170+ beatstick, let’s ask this: just how common is Goyf in the format? How many decks really use it? How many green decks use it? How many top tier decks use it? Breaking down this question into these different pieces is a great way to put Goyf in perspective. If you hang out with the same Magic players that I do, you probably hear stuff like this all the time: “PLAY GOYF OR DON’T PLAY GREEN.” Or “If you want to win tournaments with creature decks, you must play Goyf.” These kinds of statements are rampant in Modern circles, and I want to put them to the test. In analyzing these questions, I will reference data from our Top Decks page. This will ensure accurate data from the last month of Modern, and guarantee we are all looking at the same dataset. Let’s start with a big format picture. What percentage of decks in Modern actually use Goyf? I’m actually going to modify that to “What percentage of competitive decks in Modern actually use Goyf?”, just because I think that most players actually mean the latter when they ask the former. As much as I love me some Five Color Humans, Kill Mill, Treefolk, and Slivers, these probably aren’t the best way to take down tournaments. So for now, let’s stick with competitive stuff. I’m going to define “competitive” as any deck that is classified as Tier 1 or Tier 2 in Top Decks. We could also include decks that have 1 point, but Tier 1 and 2 account for enough of the metagame (73%) that this should be sufficient. Looking at those top decks, here are the shares for decks that do run Goyf and decks that do not. Total percentages are for Goyf/Goyfless decks relative to the entire format, and then just as a percentage of the Tier 1/Tier 2 decks. Wow. Where did Goyf go? It turns out only 21% of the Tier 1 and Tier 2 decks are playing Goyf. Looking at the entire format, at least 57% of the format isn’t rocking the Goyf at all, and that doesn’t even consider all the lower tier decks. In fact, we can bet an overwhelming majority of those aren’t either (Storm, Mono U Tron, UW Control, etc.). So Goyf is by no means “necessary” for success in Modern. What about for green decks? This is another common complaint I hear about Goyf, one that is sure to make all Scapeshift and Tron mages very sad. Just to expand our range to capture more green decks, I’ll consider any deck that has 1+ point on the Top Decks page. Goyf is certainly more common in green than it is in Tier 1 and Tier 2 decks, but way less common than most people probably predicted. Even narrowing to just green decks, the majority of competitive and semi-competitive strategies are still not using Goyf at all! 56% are doing something else. Only 44% of them are using Goyf. Moreover, the sheer range of green decks that don’t use Goyf is much more impressive than those that do. Goyf decks are really all midrangey kind of decks. Goyfless decks, all 56% of them, are combo, aggro, control, ramp, and a ton of other strategies. All of this is to show you don’t need Goyf to enjoy Modern. You can play competitive decks without Goyf, and you can even play competitive green decks without Goyf. So the next time someone tries to get you down about how critical Goyf is for Modern, just slam down a turn 3 Karn Liberated to show them who’s boss. Unfortunately for the budget-minded player, some decks definitely do need Goyf. Abzan, Jund, Sultai Control, and Temur Twin are decks that really do require the baddest Lhurgoyf on the block. If you pilot these decks without Goyf, you run a real risk of playing at a disadvantage, especially if you don’t know the best cards to put in its place. This next section is about identifying the best budget replacements for Goyf in your decks. If you already have your Goyfs sleeved up and ready for the next PPTQ, this section can still give you insights on ways to beat enemy Goyfs. But if you’ve been spending those hard-earned Benjamins elsewhere, then read on for some great substitutes to Mr. Green himself. These are listed roughly in order of how good a Goyf impression they do. I’ll also list their lowest NM price from TCGplayer’s card store. When you look at this card, I want you to pretend that Tasigur doesn’t even have that second ability. Why not? Because you would play this guy as a 2 or even 1 mana 4/5 on its own. At that point, the recursion is just gravy. Tas does the best Goyf impression because he’s the closest you get to a true 2 mana 4/5, which is exactly what the average Goyf is itself. Tas is even better at times, such as when you play him for just one mana, or when the graveyards are volatile. Goyf shrinks. Tas is always 4/5 of shirtless manboychild. Also, immunity to Abrupt Decay and Inquisition of Kozilek is invaluable in a format that is about 15% BGx of some kind. Once you add the ability to the mix, Tas becomes a real all star. We saw Tas’s recursion in action at both PT Fate Reforged and GP Vancouver, when Abzan players used his ability to stay in the game and keep the value coming. There’s a tiny bit of anti-synergy here when Tas starts growing opposing Goyfs, but that can just as easily be true synergy if you are running your own, or if you are just running delve cards like Murderous Cut, flashing some Spirits back into play, etc. Of the main green decks that run Goyf (Abzan, Jund, Temur Twin, and Sultai Control), all but three of those can just run Tas instead. In fact, even the non-budget versions of those decks are running Tas alongside Goyf. Don’t got the Goyfs? Just run more Tas. Chances are good you will lose at least one of them to something, so going up to 3 won’t often hurt. As for Twin, your best bet with Tas is either to switch to Grixis Twin, or to use one of the other substitutes I’m about to cover. If you can’t beat ’em, eat ’em. Ooze is not only a super solid replacement for Goyf in your own deck, it’s also a powerful anti-Goyf card in its own right. Heck, in a format full of Snapcaster Mage and Lingering Souls, it’s just a good card period. The bad news is that Ooze will rarely land as big as Goyf. It can get bigger, sure, but that is going to take time and mana. Your average turn 2-3 Goyf is about a 4/5, and Ooze needs 3 more mana invested to even be able to block or attack profitably into enemy Goyfs. You also need a respectable green manabase to support Ooze; no one wants to get stuck on just one green mana that you need to save for enemy Snapcasters. Thankfully, that’s where the bad news ends. Even though Ooze requires a bit of upfront investment to get big, that exile effect can actually shrink opposing Goyfs if targeted correctly. Add to that the value gained from stopping a Souls flashback, and Ooze becomes much more attractive. Don’t forget the synergy between Ooze and Tas if you are trying to get more selection in your recursion. Ooze is an excellent one-to-one replacement for Goyf in a lot of decks. It plays a grindy game, shrinks opposing Goyfs, and does wonders handling Snappy/Souls (both of which are hallmarks of value-driven strategies that will seek to gain an edge in the mid and lategame). It also gives you some valuable life points against the varied aggro decks of the format. Think of just subbing in Ooze for all your Goyf slots in any of the main green decks. A 4/5 Tas will stare down a 4/5 Goyf all day, but a 5/5 Angler will just swallow it. Not to mention swallowing other Tas’ and Rhinos on the other side of the field. It turns out that 5/5 is just massive in this format. Few creatures can profitably tangle with the Zombie Fish, and even when it dies it will almost always be in two-for-one exchanges. Angler’s big downside is that you can’t reliably cast this card on turn 2. There will even be games where you won’t get it down on turn 3. But assuming you go a reasonable opening of 2 fetchlands and 2 spells, Angler will be a realistic turn 3 play for most decks. And if you get more fetchlands and/or hit with an opposing discard spell, then you can actually get down Angler on turn 3 with discard or Path to Exile/Lightning Bolt backup. At first glance, there might not seem like many reasons to play Mandrills over Tas or Angler. It doesn’t have that magical 5 toughness like its competition, nor does it have Tas’s upside. It also isn’t big enough to block and kill those magical 4/5s unlike Angler. So why play Mandrills at all? The monkey squad has three key advantages over those cards that can easily outweigh their disadvantages in the right deck. To start, it’s actually green, unlike Angler and Tas. This is a big boon for decks like Temur Twin or the currently underplayed Temur Delver — decks that want to play Goyf but don’t want to switch from Temur to their Grixis alter-ego. Second, Mandrills is much easier to cast than Angler on turns 2 or 3. You will almost never see turn 2 Anglers unless you are going all-in with, Chapin-style Mishra’s Bauble style strategies. Even turn 3 Anglers won’t happen all the time, and when they do you won’t always have mana up. Mandrills doesn’t have that issue. Like Tas, it’s an easy turn 3 play with 1 or even 2 mana open, and a possible turn 2 play in the right matchup. That brings us to the third reason to play Mandrills, which is something not even Tas can boast: Trample. Why is trample good? Lingering Souls says hi. Hi, hi, hi, hi — once for every Spirit that chumps your Goyf, Tas, Angler, and Scooze for four obnoxious turns. Even without Souls, trample is still a great ability to force more conservative blocks by an opponent, especially if you are on the attack. Mandrills is one of the more versatile Goyf replacements. It goes into midrange strategies that need to punch through opposing Spirits; it goes into aggro strategies that didn’t like their Goyfs being chumped by Sakura-Tribe Elders; it goes into tempo strategies that want to just land a threat and protect it without worrying about smaller blockers. And if you have any cards at all in your deck that pump things, even just little Noble Hierarch, you’ll get even more mileage out of trample. Consider as a replacement in Zoo, more aggressive Abzan decks, and Jund. What would a budget and tech article be without your one weird, outside-the-box suggestion? Grunt fills our quota for the day, but also gives us a very strong and functional creature in this current Modern metagame. Between Snapcaster, Souls, delve, Goyf, and all the other graveyard-dependent cards (and strategies) of Modern, it’s great to use cards that attack that resource. Grunt does this in a big-impact, low-cost way. On the front end, you get a solid 4/4 for 2. But as you keep Grunt around, you get to blast through your opponent’s graveyard to keep their graveyard-reliant threats out of play. And your own graveyard, to make sure those enemy Goyfs stay puny. Grunt is the only white card on this budget list, which feels a bit odd when most of the top Goyf deck aren’t really white decks. Abzan is, but at the point where you are playing Grunt to pillage graveyards, you probably just want to switch to the Goyfless Abzan Liege in the first place. But one place where Grunt is more useful is in the aggro decks that play Goyf, such as Zoo. Although probably not a one-to-one replacement with all 4 Goyfs, throwing in 1-2 Grunts as a bullet strategy is an interesting way to both solve your own Goyf woes and to make your graveyard-reliant opponent have a bad day. Other white strategies (Mono W Hatebears and Death and Taxes) can also consider the Grunt as a way to put pressure on an opponent and attack their resources. This is by no means an exhaustive list of Goyf substitutes. Here are a half dozen other replacements you can consider if you want to go Goyfless, along with some quick notes on their strengths/weaknesses. Tombstalker: Super big and super bad. Closes games fast. 8 CMC, even with Delve, means that this isn’t landing until turn 4 however. Weaker in decks that need to apply pressure early, but a great closer. Knight of the Reliquary: A Kibler specialty. Knight typically hits play as a 4/4 or larger and can easily outpace Goyf over just 1-2 turns. On slower starts, KotR can be Bolt-bait, and she doesn’t apply pressure as early as Goyf does. But in decks that have a midgame plan, she’s very tough and closes games even faster than Goyf can. Quirion Dryad: Old school Miracle Gro lives! Temur Delver style decks can try out Dryad, pumping her with Gitaxian probe, Gut Shot, and other effects. Smaller than Goyf at first, which is bad if you are on the defensive. But as a closer, she can get out of control fast. Leatherback Baloth: If you are heavy in green, Baloth gives you the 4/5 Goyf body without any drawbacks and at just one more mana. A turn slower, can’t get bigger, but also can’t get smaller. Putrid Leech: Dangerous in this current Burn-filled metagame, but if you want an aggressive replacement for Goyf, Leech doesn’t do a bad impression. Stay ahead in life and watch Leech do work. Although Goyf will often be stronger than all these cards, there are still plenty of examples where these cards can pull Goyf’s weight. Or even pull more weight, depending on the situation. Some players want to run decks that don’t use Goyf at all. Other players want to run those Goyf decks, but just substitute something in place of the million-dollar-man monster. And other players want to run cards and strategies that take advantage of those players who do rely on Goyfs. Because if you already can’t afford Goyfs yourself, or are playing a strategy that doesn’t count on them, why not go after those people who do? This is a great way to attack the metagame, save money, and vary your gameplan against a range of decks that rely on Goyf and similar cards. Here are three cards to get you thinking about different ways to exploit decks that rely too heavily on Goyf. These kinds of cards are not feasible if you are running Goyf yourself, but once you aren’t, they open up a whole new world of hateful options. Poor Savannah Lions. There was a time when Lions was considered aggressive, but this bad lady puts them to shame. Militant is by far one of the scariest one drops in Modern for many decks. On the surface, she looks like an innocuous beater that dies to every removal in the format and doesn’t directly affect the board state. But once she gets going, she wreaks havoc on opposing game plans. Just looking at the Goyf issue, it’s pretty hard to have an average 4/5 Goyf without sorceries and instants in the graveyard; Militant on her own all but assures a 2/3 Goyf in most scenarios. She totally shuts down Snapcaster, turns Souls into a bad Raise the Alarm, makes Delve much harder, and randomly messes with all kinds of Modern decks like Storm, UW Tron, 4C Gifts, Assault Loam, etc. Goyf decks can’t play her, but if you run something like Mono G Stompy or certain Hatebear/Death and Taxes variants, Militant will be happy to fight for you. Even if she dies in the early turns, she takes the spell with her to the afterlife, and that’s one less removal spell your big guns need to worry about. And left unchecked, she turns off so many value cards on your opponent’s side. A mainstay of Tron decks and even Merfolk decks, it’s time that more Modern players start using Relic in their 60. Like with Militant, Relic just wrecks decks that rely on the graveyard. Unlike with Militant, Relic just wrecks a lot more decks. Even decks that don’t care as much about instants and sorceries will have serious trouble with an active Relic: Griselbrand, Dredgevine, Living End, etc. That’s on top of all the Goyfs, delves, Snapcasters, and Souls you are already ruining. Also unlike with Militant, Relic is not a card your opponent is ever going to kill unless they are so desperate that they are probably losing anyway. Even then, you can almost always convert it back into a card. Besides, until they do kill it and/or you sacrifice it, Relic is going to ping away the opponent’s graveyard one valuable card at a time. Because the card is so cheap, there are lots of decks that can use this. It’s a viable 1-2 inclusion in numerous control decks and even some more midrangey ones, depending on the number of graveyard-reliant decks they need to worry about. Modern players have been using EE for a long time, but the card got some special coverage at GP Vancouver as a UR Twin bullet for handling Infect; it’s one of the most cost-efficient ways to get around a Spellskite, and even to kill the Skite itself. Explosives is also very versatile if used in 2-3 colored decks that don’t rely on their own 2-3 CMC threats. Just looking at Abzan, EE will destroy not only enemy Goyfs and Scoozes, but also Souls tokens at almost no investment, and even Lily as she hides behind a wall of blockers on high loyalty. EE is also strong against all those aggro decks that rely on a 1-2 CMC curve, like Bogles, Infect, Burn, Zoo, Merfolk, and others. Although you can run the card in decks that use Goyf, it’s a much more effective strategy to run it alongside cards that don’t matter as much if they get blown to pieces. This is exactly the sort of strategy that a deck like UB Tezzeret can take advantage of in this current metagame, and I encourage you to look for other ways to abuse a card like EE in a Goyfless deck. With all these different card options, strategies, and deck options, your opponents will probably be keeping those Goyfs in the trade binder for a while. Although Goyf is certainly one of the best cards in Modern and an indispensable piece to many decks, especially top tier ones, it isn’t nearly as essential or irreplaceable as many would have you believe. So keep thinking on budget and creative ways to get around your lack of Goyfs and even turn that to your advantage. Or we can all just pray for an MM3 where Goyf decides to jump down to rare? Interesting article for sure. I’m especially intrigued by cards like Jötun Grunt and Hooting Mandrills, as I hadn’t really considered them before. Another oft mentioned goyf substitute is Vinelasher Kudzu, although it shares Gurmag Angler’s problem of needing a fetch heavy mana base. 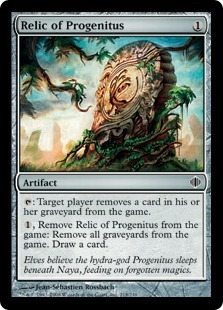 Other (potentially bad) budget replacements: skinshifter, bloodhall ooze, myr superion, vinelasher kudzu, awakener druid, kavu predator + grove of the burnwillows, strangeroot geist. I agree that you can metagame to beat Goyf, but that doesn’t mean there’s not a problem surrounding Goyf. @Brian: I’m not sure if I agree. Even looking at JUST the Tier 1 decks (Affinity, Burn, Infect, UR Twin, Abzan), only one of them plays Goyf. If you wanted to play a top tier Modern deck, you still have 4 other viable options to choose from even if you don’t own a single Goyf. Oh I certainly agree, there are a lot of alternative decks that do not run Goyf at all, but saying that there are better alternatives in green seems… not to be repetitive, but it seems disingenuous. To propose Tasigur or Angler or Hooting or Jotun as an alternative to Goyf just doesn’t answer the fact that Goyf is a powerhouse and carries his pricetag for a reason. Any of the delve options suffers from the fact that both Remand and Cryptic Command see heavy play. Having a Tasigur remanded is awful, and can make it difficult to cast the subsequent turn. Similarly, the value of getting to counter + bounce a Tasigur is often better than the standard mode (counter+draw). While it’s good to think outside the box on goyf alternatives, it’s important to remember that all of these are sub-optimal replacements that don’t come close to the real thing. I think it’s pretty clear that Goyf is Goyf and you can’t really replace it. Although there are definitely decks that don’t require Goyf, if you are playing one that does then yeah, you will eventually need to get the card. That said, this doesn’t mean you can’t play decks and cards that attack enemy Goyfs, even symmetrical ones that would hurt your own if you ran them. To me, it comes down to the fact that this is a polarizing issue. Some people see “budget Goyf” articles and immediately think that the point is to invalidate Goyf as a card. But that’s not quite what the articles are doing. They are just presenting alternatives to the creature for those who are still in the process of getting them, or those who just don’t want to play them period. Ah good! I was confused when I read “you can even play competitive green decks without Goyf” I thought you meant that you could play *good* green decks without Goyf! Silly me. Literally known as a warped format. You end with an unfun metagame where you lose at matchup – Goyf decks are the most powerful but easily fall to the cheap Anti-Goyf decks, but the Anti-Goyf decks fall apart to any other archetype. If your options are “play that card or play what kills that card because playing any other option makes you lose”, it’s a warped format. *or refuse to buy them because Wizards is still favoring hoarders over the gameplayers. Minor nitpicking, but dryad militant only exiles a spell that kills her if that spell is a burn or -x/-x spell, as she dies to SBE after the spell has finished resolving. This is different from a straight up destroy/exile, where she leaves play in the middle of the resolution and thus not in play when that spell is put in the graveyard. I find it very odd that not a single replacement idea for Goyf was given. Given the (very) limited dated here, how do we know that the decks running Goyf are pulling the wins for their archetypes, while the Goyfless Wonders are skewing the data with their losses? Also not taken into consideration is Goyfs TREMENDOUS pricetag, which is preventing players from obtaining it. So now we have a loop: Goyf is good, but you don’t need it; but Goyf is so good, it’s worth 180 dollars each. Which is it Wizards? Is it good or not? Are their replacements or not? The article is split between 3 pages. The second page has goyf replacements. Sorry about that: this article was one of our earlier ones when we were experimenting with multiple pages. It’s been switched to one page to be clearer. Apologies for the mixup!